Five Dock, AUS. 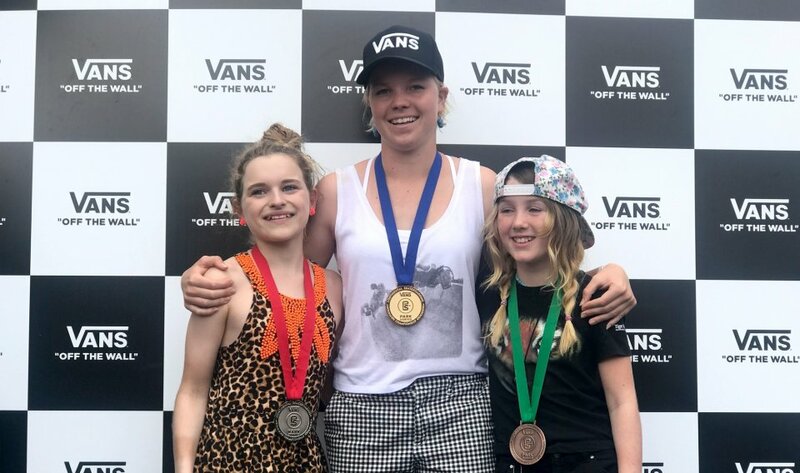 (April 30, 2018) - Vans Park Series, the definitive World Championship park terrain skateboarding competition series for men and women, proudly presented the first stop of the 2018 Continental Championships yesterday at the historical Five Dock Skatepark in Sydney, Australia. Witnessed by Five Dock locals and audiences around the world through the live webcast on the Vans Park Series Official Website, 2017 Vans Park Series men’s pro tour challenger Keegan Palmer and Oceania Continental defending champion Poppy Starr Olsen rose to the top of the podium by executing jaw-dropping flawless runs, claiming first-place VPS Oceania Championship wins and their coveted invites to the series’ World Championships this October. Following Palmer in his first-ever Vans Park Series appearance, Australia’s Jakob Robinson’s technical trick selection and smooth style granted him 2nd place, while New Zealand’s Bowman Hansen’s unstoppable performance awarded him 3rd. In the women’s division, Sabre Norris tracked closely behind Olsen in 2nd with her unmatched trick selection, while young gun Charlotte Heath’s impressive maneuvers and switch combos granted her 3rd. Keegan Palmer and Poppy Starr Olsen will be joining the VPS select pros and the remaining series’ continental champions to compete at the 2018 Vans Park Series World Championships. Congratulations to Keegan and Poppy!